During visit to Enterprise, AL, Local 2003 members pose with the Harley-Davidson Tri Glide motorcycle that will be raffled off to raise money for GDA. From left, Adam Beasley, member and GDA volunteer; Teresa Blevins, member and Guide Dog recipient; Liberty, her guide dog; and GDA outreach director Steve Cohan. A 2011 Harley-Davidson Tri Glide Ultra Classic motorcycle donated by Harley-Davidson Motor Company and customized by Legends Vintage Motorcycles is touring the country, giving IAM members and the public an opportunity to see the spectacular bike in person and to buy raffle tickets for a chance to win it. 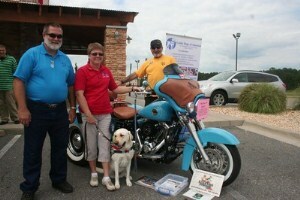 The motorcycle was built as a fundraiser for Guide Dogs of America (GDA) and has travelled to eight states so far this year. GDA outreach representatives Steve and Grace Cohan coordinate activities for the bike and will have visited some 25 cities in six months before the bike is raffled off on November 19, 2011 at GDA’s annual banquet in Las Vegas, NV. If you would like a chance to win this one-of-a-kind trike, call Guide Dogs of America at (818) 833-6429, or email dehartford@guidedogsofamerica.org. Tickets are $5 each, or 5 for $20. Winner need not be present at the drawing. All proceeds from the raffle will go directly to Guide Dogs of America and their mission to provide professionally-trained guide dogs to blind and visually-impaired individuals at no cost to them.